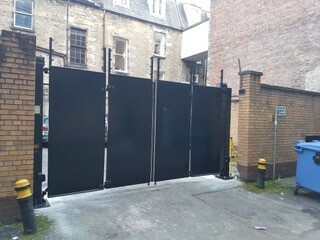 Bi Folding Gates can also effectively secure an entrance at a reasonable cost. 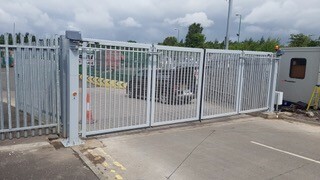 All the gates in the product range are fully welded, designed in accordance with the normal static load requirements and in accordance with DIN EN 12424 and 12444. 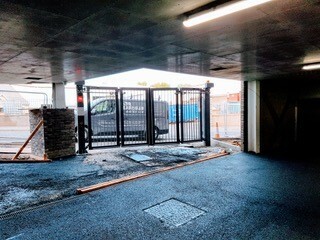 The bi folding gate range provide the perfect solution for security in confined locations, or where speed of opening is important giving twice the span in an opening space. This increased speed also ensures that site entrances are open for the minimum amount of time possible to allow authorised users to access without allowing unauthorised persons to enter. Commonly chosen for applications such as multi storey car parks, prison entrances and corporate access roads, they provide an aesthetically pleasing, high security entrance control solution. The design incorporates two mechanically connected leaves per side, which swing open together thus providing a greater speed of operation than other automated gate systems. They are fitted with reliable heavy duty drive systems which are almost silent in operation and have an impeccable service record with maximum longevity in the most demanding environments. 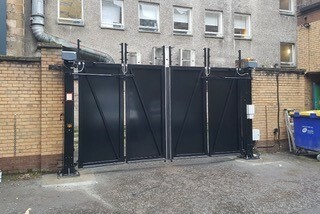 The small swing arc needed by the dual gate leaf system allows this bi folding gate to be located in situations which would rule out the installation of conventional gates.